Hey everyone! I haven't been here in a long time. How are you, developers of NerdKits? I keep rereading the datasheet, and I see the line saying "Both the Flash and EEPROM memory arrays can be programmed using the serial SPI bus while RESET is pulled to GND" So... Does it mean I can NOT program fuses with SPI? Fuses and lock bits can be programmed via an ISP type programmer (which is what you have). Do you have a photo of your setup for programming the chip? Remember, the stock NK setup will NOT allow for programming via ISP. You have to make one change. In order for the programmer to toggle the reset line as needed, you have to replace the jumper wire that would normally go from pin 1 to VCC with a resistor (10K should work fine). That way when your programmer needs to pull the reset to ground it can otherwise the resistor will pull it up. I cant upload the picture at the moment, but i did modify setup from the original - removed the program enable switch (pin 14 is now open), and connected RST from avrisp2 to reset pin. Pins 7 and 8 are vcc and gnd, crystal clock is also there. On the other side of the chip - gnd, AREF, and AVCC are connected. RESET is without any resistors, because, i believe my programmer already has one in its circuit. (take a look) Anyway, adding a pullup resistor didnt change a thing. oh look, i just realized that lock fuse changed to 0x3f (01111111) after chip erase, while it was 0x2f (01011111) before. However I still can't write to efuse, lfuse, and hfuse. picture would be nice. I had similar problems when I was using avrisp mkII clone. I had 2 issues: 1) RST was pulled high 2) Had jumpers connected in the wrong place on my clone avrisp that made it act funky. That's the exact programmer I have! Got it on ebay in kit form. The only difference is I reprogrammed the firmware as a USBASP. Well I feel stupid... So, I went to the bootloader dir on my computer (foodloader), and decided just to try and type make... IT WORKED!!! Turns out, since in lock byte, only first 6 bits are used, I couldn't write 0xff in it, but I could write 0x2f, 0x3f, or any other thing. same goes for the rest of the lock bits - I could write only the amount of bits that were actually used. However, instead of blinking every second, it blinks every 7 seconds! so i susoect it runs on internal clock or something, but my lfuse = 0xf7!!! (0b 11110111) just like in fuses_mike.txt in the bootloader. Also tacking clock out makes the blinking stop completely. Any ideas why? (or whatever the correct value is) in your source code, or -DF_CPU on the avr-gcc command-line in the makefile? I had the same problem, it was something fairly simple (IIRC), I'm just looking through my notes to see if I documented what I did to fix it. If I find it, I'll give you a shout. I'm sorry for a long post, I'm just really frustrated with this and would appreciate if you checked my math. Alright... My recent findings... I'm loosing exactly 10 times of the frequency somewhere. How I found this out first. In delay.c we see 2 NOPs is perfect for 8 MHz clock. 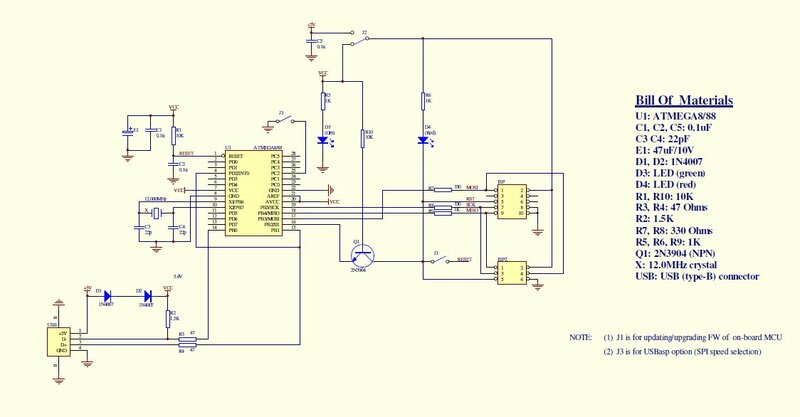 In the datasheed for ATmega168, it tells us that 1 NOP takes 1 clock to execute. So, I'll just leave Number of NOPs defined in the function as 2. So it seems like my frequency is exactly 10 times (!) as slow as it is supposed to be, no matter the source of the clock. Any ideas where can I loose 10 times the clock? Alright, I've found all my missing clock cycles! I ended up disassembling the program and looking at what's going on there! Turns out, if I compile delay.c with -O0 flag - it will add a lot of op-codes there that will just slow you down! Then I recompiled everything with -O2, which removed many of those op-codes and my LED blinks at what seems exactly half a second :D However, -Os did decrease resultant file size (my executable was down to about 280 bytes), but LED started blinking every 750ms instead of every 500ms. In case you are wondering, the version of avr-gcc I have came with my WinAVR 20100110 install and reports as 4.3.3 (WinAVR 20100110). I've thought of trying to learn it. But I don't really have the time right now. I've some informative stuff online for learning avr assembler but haven't really pursued it.